The UBPartner XBRL Toolkit (XT) already delivers low-cost reporting tools to banks and insurance companies across Europe, making the process of submitting CRD4 and Solvency II regulatory reports as simple as possible. Now, the new XT Portal capability takes this to a new dimension in terms of additional workflow, access control and performance. UBPartner has an excellent reputation and its underlying XBRL technology is used around the world in major projects. UBPartner, a leading European provider of XBRL tools and services (http://www.ubpartner.com), announced today the addition of a new Portal capability to its XBRL Toolkit (XT). 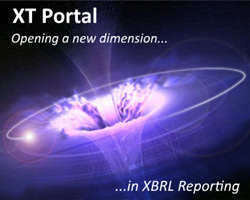 The XT Portal provides the same simple-to use and powerful XBRL tools to convert, validate and render XBRL documents, while further enhancing the usability of these tools by adding a new enterprise-level interface, flexible shared workflows, role-based access controls and enhanced performance through parallel document processing. The UBPartner XBRL Toolkit is already being used by hundreds of banks and insurance companies in Europe that need to submit CRD4 (COREP and FINREP) and Solvency II reports in XBRL format. These simple-to-use, yet powerful tools have also been adopted by industry and financial application suppliers, systems integrators and services firms to enable them deliver 100% compliance for their clients. UBPartner has further extended its support for XBRL by adding pre-mapped templates for local National Specific Templates (NSTs) to support additional XBRL reporting requirements in countries such as Ireland and France, plus new XBRL reporting frameworks, such as the Bank of Israel’s new Banking Supervision Directives. “The Bank of Israel’s adoption of XBRL reporting was totally new for us, so we needed a partner who had the specialist software and the expertise to provide the right support to our banking customers. UBPartner has an excellent reputation and its underlying XBRL technology is used around the world in major projects.” stated Reshef Radin, Board Member responsible for Partnerships and Banking Solutions at HMS (http://www.hms.co.il/en/), a leading Israeli systems integrator. “The partnership has worked well despite the BoI implementation being very difficult as the regulator, banks and local IT suppliers were learning as they went along”. “UBPartner’s XT Portal and pre-mapped templates removes the need to understand complex XBRL syntax. Our users can simply load the data into the template, then upload and run the XBRL conversion tools to generate a 100% compliant XBRL document. The system delivers a complete set of validation reports that alert the user to any errors in the report. They can then review any errors at a business level, by highlighting them in the template. Once the XBRL document is generated with no errors, it is ready to submit” he added. “Many of our customers across Europe were asking how they could utilize our XBRL Toolkit in a multi-user, multi-taxonomy environment. So we worked with them to define a set of capabilities that have become the XT Portal. They helped us to test and develop the core requirements and their feedback over 9 months has been invaluable in ensuring that the XT Portal meets exactly what users are looking for to extend their current XBRL systems and to integrate XBRL more fully into their reporting processes.” said Laetitia Boublil, Development Director at UBPartner. “In addition, we wanted to help firms who already have their own preferred Portal for reporting. So we have worked with a development partner to ensure that the same APIs for our tools that underpin the new XT Portal can also work with standard commercial Portal environments, such as Microsoft SharePoint.” she added. The UBPartner XBRL Reporting Toolkit does not require an extensive implementation phase over many months, nor does it require that confidential information is sent over networks to remote portals or services to convert or validate the data. The latest version of the UBPartner XBRL Reporting Toolkit and the new XT Portal will be made available for download from the UBPartner download website in the coming weeks for customers and partners who have current agreements. UBPartner is a privately owned company with headquarters in Paris and offices in London. It provides a full suite of solutions and services that enable companies and regulatory agencies to realize the benefits of XBRL – from the underlying processing engine, to desktop development and deployment tools, all the way to packaged solutions for regulators and government agencies. UBPartner technology and tools are used today in many advanced and demanding XBRL environments such as market regulators, government agencies and major corporations in France, Belgium, UK, Ireland, Poland, Norway, and Luxembourg and by leading software vendors, such as Oracle, SAP and Infor.